Larkholme School is committed to offering opportunities to all of our children to reach their full potential in School Sport and PE. 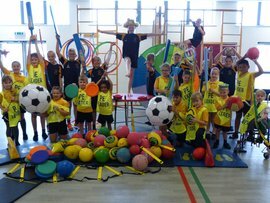 Welcome to Larkholme's new School Games page! Hopefully this photograph will show how sport and PE is integral to life at Larkholme. We are excited about starting this new updated page, and will ensure there are regular updates on everything going on both in and out of school. Please check this site for up to the minute blogs. Larkholme Primary School achieved Gold award last year.